Will Credit Counseling Help You? These days, more and more individuals in California and across the country are struggling with credit cards and other unsecured debts such as store cards, gas cards, medical bills, doctor bills and more. If unmanageable credit card is also a reality for you, you may be seriously considering credit counseling. In fact, if you have a serious level of debt and are also considering bankruptcy, it's now required that you undergo credit counseling prior to filing for bankruptcy. The goal of a credit counseling program is to combine or consolidate all of a consumer's debts into one more manageable payment each month. Through the benefits of debt relief such as lower interest rates and the waiving of late fees and penalties, a debt management plan (DMP) coordinated by a credit counselor or debt counselor can help consumers get out of debt at an accelerated pace and, quite possibly, save a substantial amount of money as well. Credit counseling agencies, through certified credit counselors or debt counselors, provide a variety of helpful debt relief services for individuals and families. This includes assessing an individual's unique debt circumstances, budgeting, financial education, and in many cases, providing you with tools to help manage your finances and move toward the dream of financial independence and a debt free future. The goal of such programs is to, hopefully, give these consumers better money management skills to help them avoid falling back in debt. Could Debt Relief Help You? 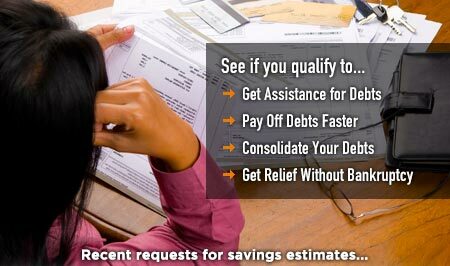 Get your free debt relief analysis and saving estimate today. Credit counseling is a proven method for debt relief that has helped many individuals and families, but it's important to know that debt management requires basic discipline and restraint to avoid credit cards. It normally takes three to five years to complete the program and realize the full benefits of debt relief. 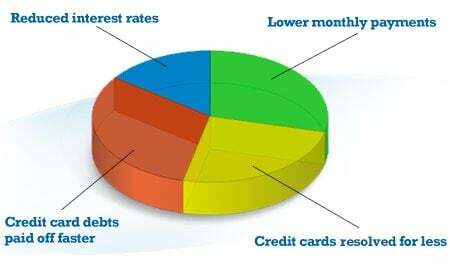 On the other hand, an alternative to debt management is debt settlement, considered a more aggressive form of debt relief that could help you get out of credit card debt faster, assuming you can accumulate money in a "set aside" account which can later be used to extend a settlement offer to creditors. With debt settlement, it is interesting to note that if credit card companies decide eventually to "sell off" your debt as "bad debt" to a collection agency, creditors may get as little as 10 cents on the dollar, so it is not surprising that credit card companies may be willing to accept a reasonable settlement offer made by you or by a debt settlement company on your behalf. It is important to be aware that when consumers default on the terms of credit card agreements to set aside monies in a settlement fund, creditors may threaten or take legal action. In addition, money saved through credit card settlements are subject to federal taxation. Finally, debt settlement typically will have a negative impact on personal credit, but not as serious or long lasting of an impact as personal bankruptcy. Many individuals and families in California, like many across the country, are struggling and experiencing financial hardships that make it difficult to obtain life's basic essentials, such as food, utilities, rent, or even childcare. To help people who need financial assistance, including the elderly and those needing medical assistance, the state of California has programs and services that help these people get what they need, acting as a sort of lifeline. Examples of such programs include the Children's Health Insurance Program or CHIP, Medicaid, and California Head Start. To find out more about these services and resources, go to the state's homepage Benefits section. The bottomline is, whether you choose to enroll in a debt consolidation program, debt settlement service, or even turn to the state for financial assistance, it is important to understand clearly how much debt relief can potentially save, how long it will take to realize those savings, and the impact that any debt relief program could have on personal credit and taxes. Get your free debt relief analysis and savings estimate.